5 pc. Indexable Carbide Tool Bit Set - 1/2"
Grizzly G5640 - 5 pc. 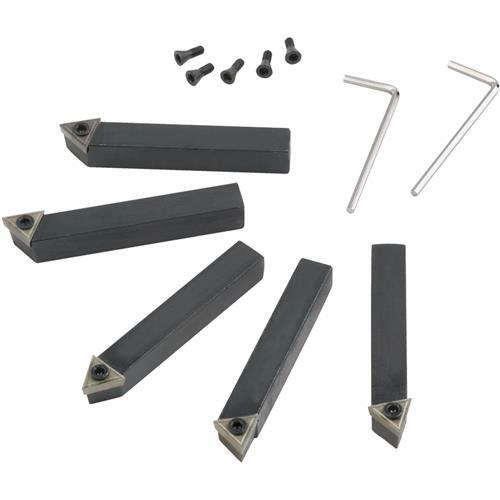 Indexable Carbide Tool Bit Set - 1/2"
This 5-piece 1/2" turning tool set features indexable carbide inserts with "spline" type hold-down screw that allow indexing without removing the screw. Each set includes AR, AL, BR, BL, and E style tools with carbide inserts, wrench, extra hold-down screws, and plastic case. See items T10375 and G6706 for replacement inserts. Uses ISO inserts TCMT16T304, or ANSI inserts TCMT32.51. The carbide that comes with the tool bits is not of a very high quality. The replacement bits which are much more expensive are of a higher quality and last much longer. The holders themselves seem to work well. The only problem is the poor quality of the actual carbide. Really good value for the money.Plus extra screws, wrenches and a wood case.